My husband and I really enjoyed our stay at Julianne’s place. It’s very clean and had everything we need. We only had one problem which was a broken shower head but Julianne told us about a spare one that was easily put back to replace the broken one. The apartment was about maybe 10 minutes away from the Charles Bridge area by Uber. Should not cost you more than $6. The apartment was well-suited to our needs. 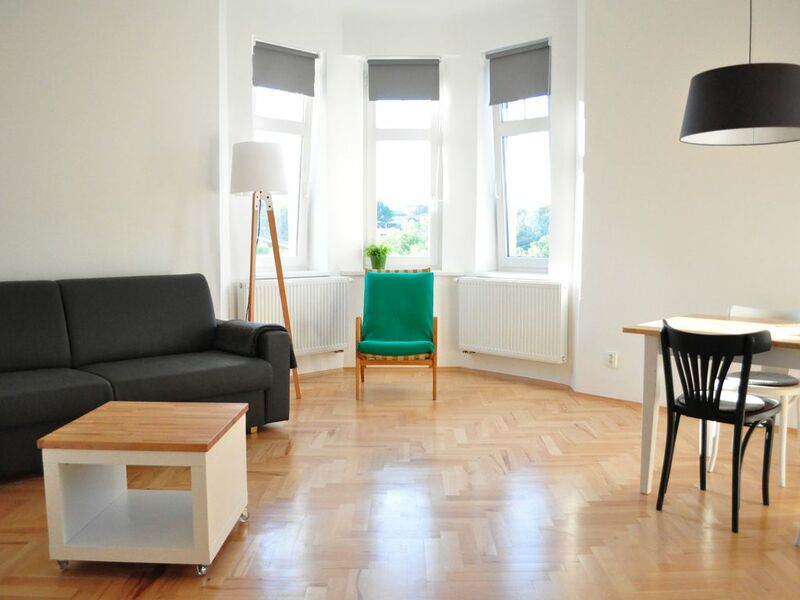 The apartment has an excellent location - directly on bus route to & from the Metro. A ride into old town took no more than 20 minutes. We rarely used our car while in Prague. Restaurant across the street has a very casual vibe and the food is very good. Grocery store was at the top of the hill - we walked. This apartment is not suitable for anyone with limited mobility - there are three flights of stairs to climb and no elevator. The upkeep of the garden is not a reflection of the upkeep of the flat. The garden is unkept, there is stinky garbage at the front gate and a bath tub lying to the side of the building. The front entry hall is similarly uninviting with garbage at the door and a very strong musty smell coming from the basement that spread throughout the stairwell. This could be a turnoff for some people. The flat itself was lovely and bright. An additional comfy chair in the sitting room would have been welcome but generally the unit is well-equipped. Very clean and comfortable with aesthetic decor. This was a great place to stay in Prague, close to everything, but also in a real neighborhood. The apartment looked exactly as the pictures showed it on the website. Julia send all kinds of information ahead of time, with places to go, maps, suggestions on eating, very much appreciated. The apartment itself is very large, with lots of windows, a comfortable bed, and everything you could need/want in the kitchen to cook for yourself. Close proximity to grocery stores was also great. I will definitely recommend this place to anyone I know traveling to Prague. Kleineres, aber funktionales und sehr nett gestyltes Appartement, welches unsere Bedürfnisse perfekt erfüllte. Nicht so zentral aber durch öffentlichen Nahverkehr gut angebunden (Bushaltestelle direkt vor der Haustür), keine Parkplatzprobleme falls mit eigenem Auto unterwegs. Werden wir, falls verfügbar, für unseren nächsten Pragbesuch, gerne wieder buchen. Dank an unsere Gastgeberin für ihre umsichtigen Bemühungen um reibungslosen Ablauf und Wohlfühlen vor Ort! Wir haben das sehr schöne und liebevoll eingerichtete Apartment im 3. Stock zu Dritt bewohnt (Platz für max. 4 Personen). Das Apartment ist sehr komplett ausgestattet und es fehlt an nichts. Sehr empfehlenswert für einen Städtetrip, wir würden es jederzeit wieder buchen. Mit der Buslinie 137 ist man in 5 Minuten am Andel und kann von dort viele Trams und die Metro nutzen, um die Sehenswürdigkeiten in kurzer Zeit zu erreichen. Juliane ist eine sehr nette Gastgeberin, die bereits im Vorfeld sehr präzise und detailliert informiert, so dass man sich voll und ganz auf den Aufenthalt in Prag konzentrieren kann und mit dem Apartment einen prima Rückzugsort zum Ausruhen hat. Wir kommen sehr gerne wieder. Der Grundpreis pro Nacht gilt für 2 Personen. ! Für jede weitere Person (max. 4 Personen) werden 16,-€ pro Nacht berechnet ! Der Mindestaufenthalt besteht aus 2 Nächten! ! The basic price is for two persons per night. For every further person (max. 4 persons) will be charged 15,-€ ! I accept 2 nights minimum stay!